Thanks to AWA volunteers who worked on FERC relicensing, these companion runs have become a mecca for advanced boaters during the last full weekend of June thru September (October in wet years). 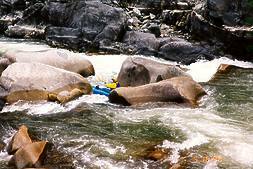 On Saturday, 1000-1600 cfs (800-1000 in dry years) are released from Cresta Dam, and on Sunday the same amount from Rock Creek Dam. 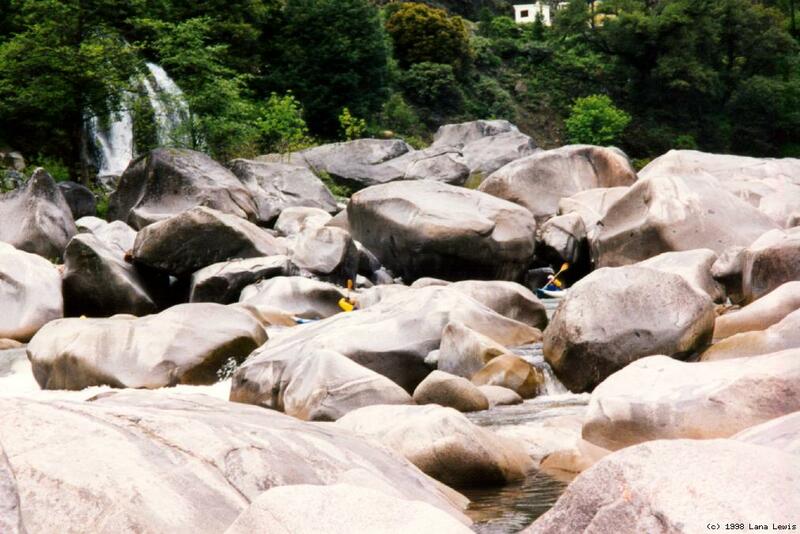 The Cresta run starts with 2 miles of incredibly scenic granite-dome class IV, and ends with 3 miles of class II before a final (avoidable) class IV. The Rock Creek run starts with 4 miles of class III, continues after a possible portage (or class V+) into the 2 mile class V- Tobin section, and ends with 2 miles of class III-IV. If you do not own a boat and want to raft this with a commercial outfitter, type North Fork Feather into the text box below and click Search. The Feather Festival 2010 will be held September 24-26th. Check the Chico Paddleheads website for details. Most years have weekend releases in late summer. July and August releases (but usually not September) may be subject to a one-week delay in case a “heat storm” occurs. PG&E is required to provide at least 48 hours notice if their weather forecast predicts an unusually hot period. Last minute news will be posted on the AWA website so check before driving there. After 2002 releases, Caltrans and CHP were very concerned about boater safety, and felt everyone was lucky that there was no major accident. Of particular concern was the parking of private vehicles near Cresta put-in. This year, everybody should use the shuttle bus if possible, otherwise we might lose scheduled releases. Food and fellowship are available at the Tobin Resort. 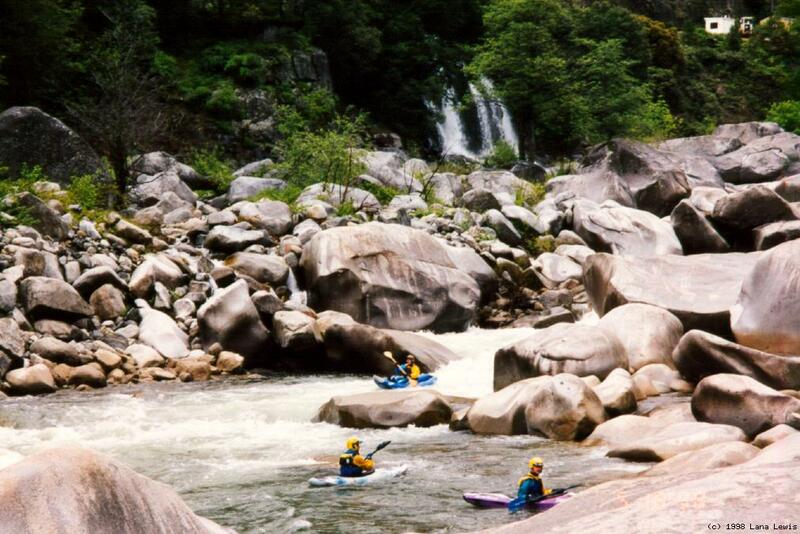 In his 1974 guidebook Sierra Whitewater, Charles Martin wrote off several runs on the North Fork Feather with a quote from Carl Trost, "the PG&E giveth and the PG&E taketh away." 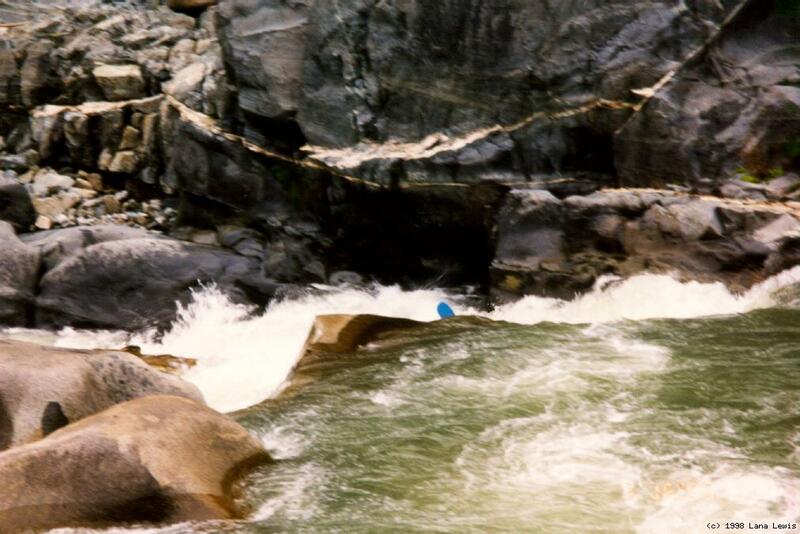 Martin did describe a class IV spring run on the East Branch, 10 miles from Virgilia to Belden, the section containing that now infamous rapid, Five-in-a-Hole. In their 1998 third edition guidebook, Holbek and Stanley describe three additional runs on the North Feather (two on the west branch, and one downstream): the upper West Branch (3.3 miles of class IV-V from Whiskey Flat bridge to Dean Road), the West Branch thru Ben & Jerry's gorge (4 miles of class V+ from Dean Rd. to Oroville reservoir), and the Poe run (2 miles of class V-, 5.5 miles of class III, no reservoir). Additionally when Oroville Reservoir is low after a string of drought years, another run becomes uncovered, with a runnable 35' dam, many miles of class III-IV, and many miles (grunt) on the reservoir. Rumors indicate there might be another run above Lake Almanor. On days of scheduled releases, AWA has operated (and may continue to operate) a shuttle bus. It's best to park near Poe Reservoir or Cresta Powerhouse and pay for shuttle, because parking at the put-in is very tight. When the bus arrives at Elephant Butte tunnel below Cresta Dam, carry kayaks down a steep granitic trail to the river. Rafts should be lowered by rope, preferably not into the bramble-filled tunnel below. This put-in might be improved eventually; stay tuned. 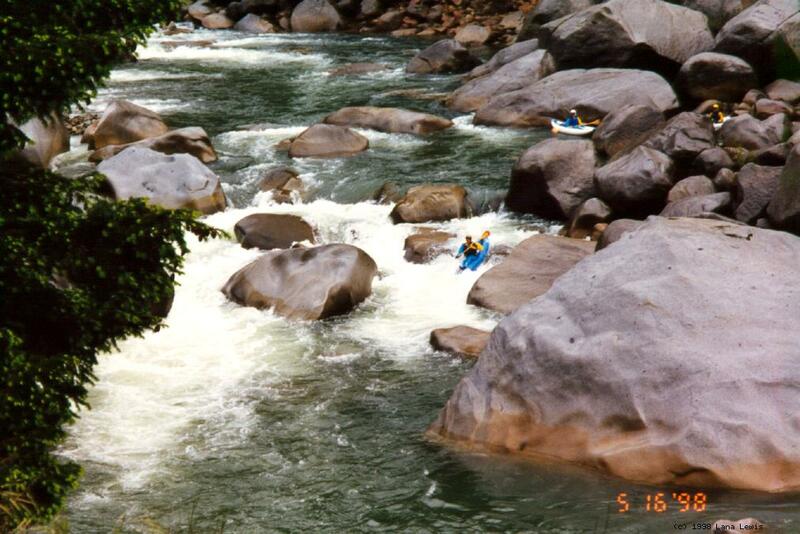 Class III rapids begin immediately, with large waves caused by bedrock and boulders. Gradually the canyon narrows and rapids become more constricted. At mile 1.1 comes County Line Falls (class IV), the most difficult rapid on this run, where a sign marks the border of Plumas and Butte counties. If you did not pre-scout it during the shuttle, scout left using the highway. Left side routes become sticky at higher flows, when a tongue fortunately develops on the far right. Below County Line, constricted rapids continue but gradually ease. At mile 2 is a highway turnout with plenty of parking, providing a good take-out for those who want to re-run the class IV stretch, or a put-in for those who want to float some mellow class II. Shortly below this turnout, the river turns away from the road, providing several nice lunch stops with a false impression of wilderness. There is a very good surfing hole on river left in there somewhere. At mile 5 comes the final class IV rapid, an extremely constricted boulder pile, which in 2002 was best run on the far right. Left-of-center looks like a good route from the top, but ends in a rock plug. Kayaks could take out above this rapid and carry to the parking lot, but that would be a long distance to carry rafts. Take out on the left up a concrete embankment, or continue thru some rapids to more difficult take-outs on Poe Reservoir. On days of scheduled releases, AWA has operated (and may continue to operate) a shuttle bus. It's best to park near Cresta Reservoir or Tobin and pay for shuttle, because parking at the put-in is very tight. When the bus arrives below Rock Creek Dam, you can either carry boats down a steep trail to the river, or carry and lower them down a shorter concrete embankment shortly downstream, being careful not to harm your craft on the sharp concrete or rebar. These put-ins might be improved eventually; stay tuned. The first 4 miles are relatively flat with occasional class II-III rapids. 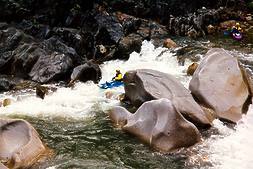 Two rapids stand out as most difficult, both visible from the road. The first is a rock fence-falls with a choice of several drops. The second is a boulder pile at the bottom of an island-left channel, in 2002 best run close to the island (a somewhat blind route). At mile 4 there is a dirt road slanting down to the river, where class III boaters can take out, and class V boaters put in. Shortly afterwards come the black and silver (Raider) bridges, which mark the start of a class V or V+ section. You must scout this section, either from the road or the river. 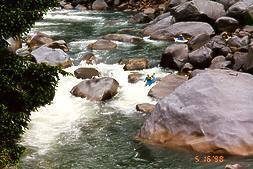 Near the beginning is a river-wide ledge that could flip boats, so considering the dangerous swim ahead, you should set safety. The complicated boulder field ahead is sometimes run in the center, cutting to the right partway down, but you must decide for yourself. At some flows the right side contains an interesting undercut arch formation. 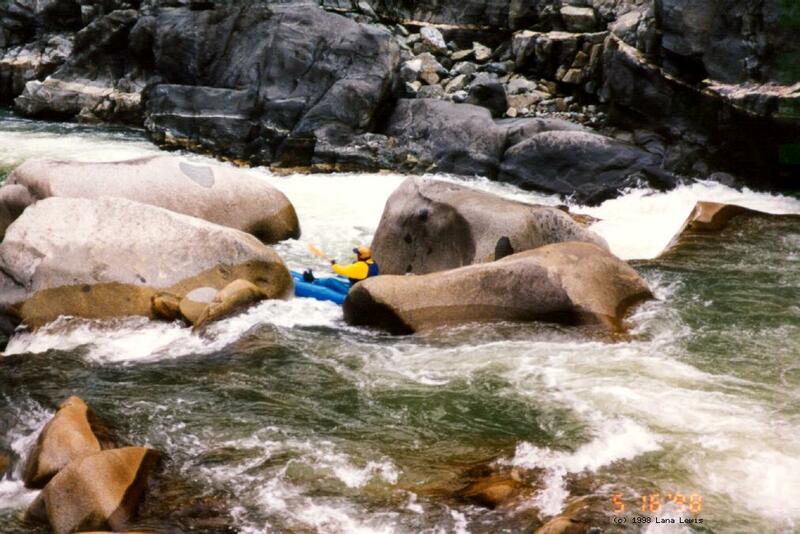 Entrapment hazards abound; hikers without PFDs regular die at low flows. The class V rapids ease somewhat before the green bridge appears overhead. Sometimes boaters portage the whole section and put in at the green bridge, where river access is unfortunately not ultra-convenient. Class III-IV rapids continue almost all the way to Poe Reservoir, making a great end to the trip. There is a fair amount of parking at a sandbar near the head of the reservoir. One outcome of FERC relicensing was that PG&E leaves more water in the river to keep fish alive, but not really enough for fun boating. Another outcome is that whitewater releases are scheduled for weekends, so California finally catches up to the east coast! 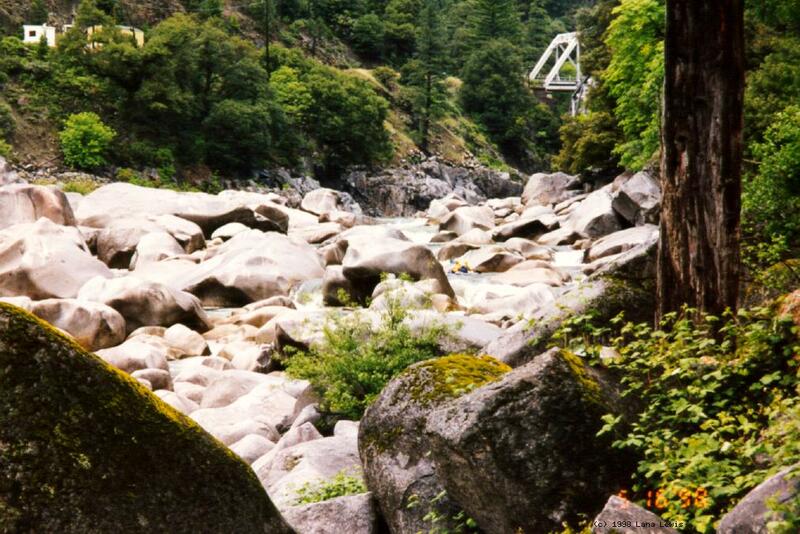 Before hydro development, this section of river probably never dropped below 600 - 700 cfs! The pictures below show the run at about 280 cfs, when the class V+ rapid (big boulder jumble) described as a portage in the Holbek/Stanley book becomes more approachable. 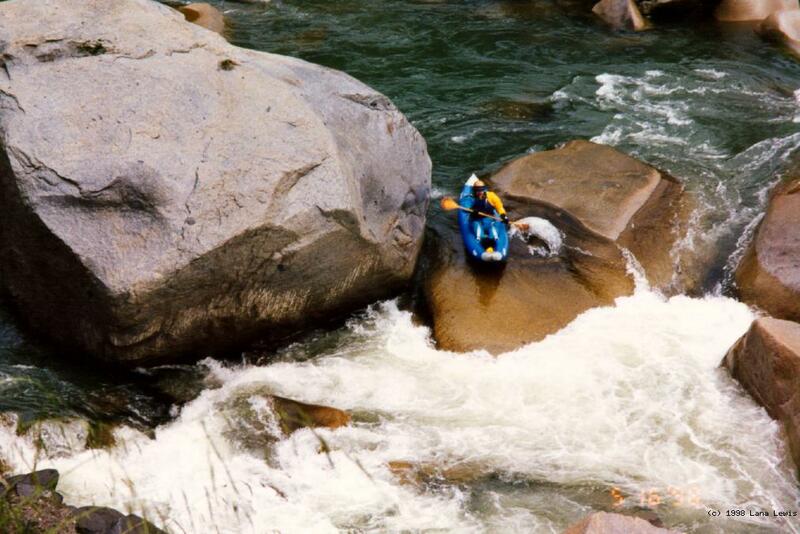 Although the Holbek/Stanley book says minimum flow is 800 cfs, you see hardshell kayaks running it here at 35% of that flow. The river is fairly flat from Rock Creek Dam down 3 or 4 miles to the start of the Tobin section, where two bridges are painted reverse Raider colors, black and silver. Once boaters hit Tobin, the bottom drops out and the fun begins. There are some ugly, dangerous spots in there; it is no place for swimmers. After 2 miles of good stuff, the gradient eases but fun drops continue. Nothing can be seen but a paddle! For high-water (monthly weekend release) pictures, see raft.org's North Feather gallery.